Siem Reap in Cambodia, the gateway to the temples of Angkor, can kickstart a romantic getaway that few places can match for atmosphere and adventure. The city's French colonial atmosphere is largely preserved, particularly around Sivutha Street and the Old Market area. You can buy presents for your love at Psar Leu's jewelry and woodcraft shops, or enjoy a candle-lit dinner at one of the many restaurants now proliferating in the city. The Perhentian Islands are some of Malaysia’s finest beach islands. Relatively underdeveloped, the Perhentians allow romantics to pretend they’re cast-away in paradise, with an easy-going island vibe surrounding the many activities in the area. The two most popular islands in the group are Perhentian Kecil, a smaller island that appeals to the younger backpacker, party-harder crowd; and Perhentian Besar, a larger island that attracts a more mature following. There’s very little infrastructure on the islands; life on the islands seems chill and ad hoc. The lack of motorized vehicles and any significant modern amenity makes the Perhentians an ideal rustic honeymoon getaway. The protected nature reserve making up the majority of Bacuit Bay and El Nido has helped make these weathered limestone islands in the Philippines into the ultimate island honeymoon getaway. El Nido is sufficiently secluded to prevent any large influx of visitors (you either endure an eight-hour drive from the closest major airport in Puerto Princesa, or you ride a chartered aircraft onto a tiny nearby airstrip), and the islands are gifted with white-sand beaches, hiking trails, dive spots, mangrove forests, caves, and a range of resorts from inexpensive to five-star. Take on all these natural endowments as a couple – whether you’re kayaking into a hidden cove on Bacuit Bay on a boat built for two, or enjoying an intimate dinner on the beach, you can make plenty of romantic memories in El Nido. Malaysia's Cameron Highlands is a cool getaway from the region’s usual humidity – a cool, hilly and sleepy area filled with tea plantations and hiking trails. You can enjoy your romantic travels in the wild, by camping out in the middle of a jungle trek, or more ideally, you can check into one of the many hotels catering to romance-seekers in the Highlands. To visit Hoi An in Vietnam is to go back in time - back to an era when Hoi An Old Town was a bustling trade center, and when ancient traditions still held sway. You see the old ways in the well-preserved buildings in the old town. You feel the old ways in the clan houses and in the old-style lanterns that light the way when darkness sets in over Hoi An. Hoi An is a great experience to share with a loved one – there’s no small amount of romance in the cozy hotels in the backpacker area and in the restaurants and shops clustered by the riverside. 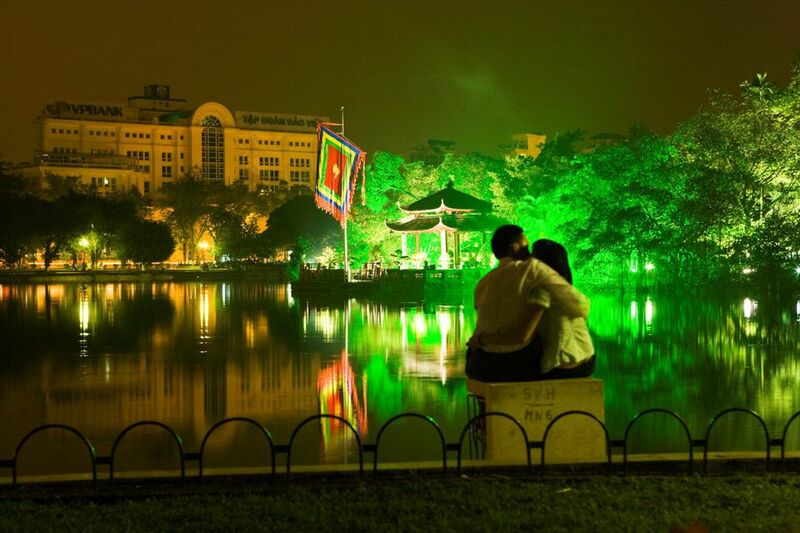 Hoan Kiem Lake is the wet, beating heart of the city of Hanoi in Vietnam. The part of the city surrounding the lake is shaded by trees and endowed with a wide path, which is often used by Vietnam’s post-war, marriageable-age baby boomers for their pre-wedding shots. And Hoan Kiem Lake is such a no-brainer for romantics who want to immortalize their love: The view is just perfect, weather permitting. 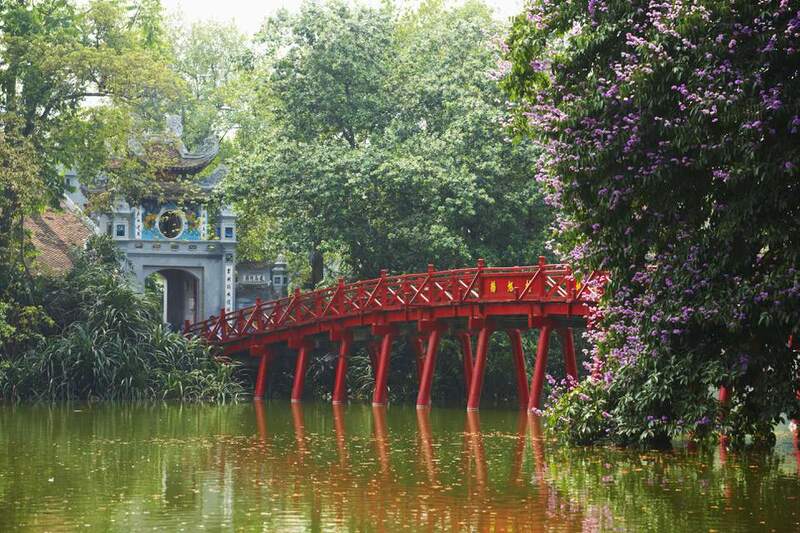 The tree branches dipping into the water, the sight of the island-bound Ngoc Son Temple at Hoan Kiem Lake's north end and the bright red The Huc Bridge connecting it to the city, seen at a distance… picture-perfect. If you want a break from walking around the Hoan Kiem Lake, just look for the Hapro Coffee Kiosk on Pho Le Thai To, opposite the bridge, for a coffee al fresco with the love of your life. If budget and time permit, you can go shopping at the Old Quarter just a few minutes’ walk away, or check out the city's other must-see sights.